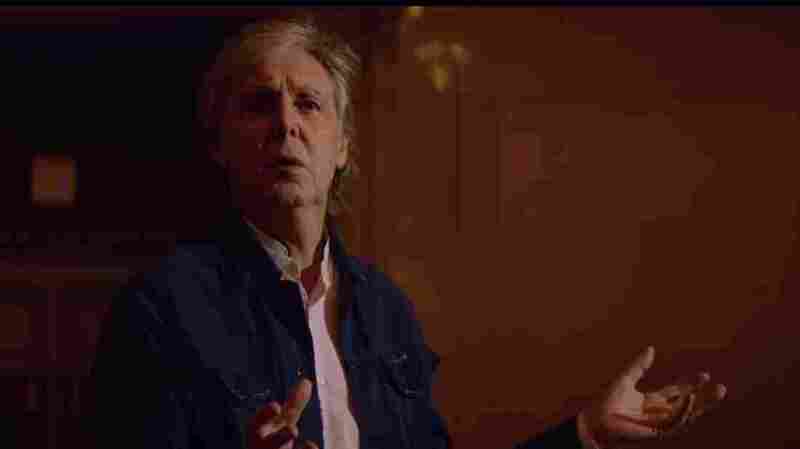 The View From Inside Paul McCartney's 'Secret' Grand Central Show The rock legend played hits, charmingly flubbed one classic and serenaded his wife in a release party for the record Egypt Station. Walking through the warm, vanilla hallway of Grand Central Terminal, I tried to enter a barricade when an army sentry — helmet, muted green-and-sand uniform, a pistol and a big machine gun — said it was the wrong entrance. "This is for the artist — go down, take a left and stick to the wall." Around the corner to the right, a small island's worth of people stood smiling, pushed up against a barricade with their phones out, asking if it was true. The person up ahead had gotten a wristband randomly on the street, he told them, causing a ripple of jealousy across the eyes of those in earshot. As we waited, a light static of amplified sound buzzed out from behind a curtain, bouncing around the marble walls and ceilings and floors, losing its warmth with each refraction. Someone put my phone into a pouch and locked it, and handed me a plastic candle. "When you hear the melody of 'Hey Jude,' turn this on." And there was Paul McCartney, the artist, standing on a low stage under the high ceilings of Vanderbilt Hall, a sort of vestigial space of the station that used to function as a waiting room and now is available to rent for weddings or concerts by living legends at a cost that begins at a reported $25,000 a night. Also there: a full regiment of technical engineers, camera operators (for the live stream, viewable below) and sound experts, including Giles Martin, the son of Beatles producer George, behind the board. Paul McCartney, onstage at Grand Central Terminal in New York on Sept. 7, 2018. The rock legend released his newest album, Egypt Station, the same day. There was Jimmy Fallon, losing his mind to every song, throwing arms and singing along and illustrating that the adolescent energy that animates his own show isn't contained to that studio alone. There was Chris Rock, shaking his head and singing along. There was the producer Four Tet, watching sagely and maybe having similar opinions about the room's acoustics. Jon Bon Jovi leaned against the wall like a lovely statue, mouthing the lyrics with a melty smize. Later, Steve Buscemi took a seat and scowled, happy. Sean Lennon stood near the back of the crowd, tapping his feet. Record executives from every step of the industry's ladder looked on, visibly brightening, when McCartney would launch into Beatles songs. (Among them: "Can't Buy Me Love," "From Me to You," "I Saw Her Standing There.") The police lining the walls smiled whenever they stole a glance to the stage, taking a split-second break from surveying the crowd. But what, ultimately, is worth taking away from a performance like this, in a space like this, surrounded by people like that, in a city like this, in a country like ours, such as it is? For one thing, it's that you shouldn't book rock bands in gilded marble rooms, unless that band is backing Paul McCartney; poor sound doesn't matter much, in the end, when you can play most of the songs in your head on-demand, like an internal Spotify. It helps smooth out those troublesome, trebly edges. And streaming the concert live, then making that stream available to watch for free afterwards, protects the whole (very expensive) enterprise from accusations of socioeconomic indifference by the world's ultra-élite. Maybe, then, it's that near-universal cultural touchstones — like The Beatles' catalog, and like Paul McCartney saying "Y'know" in that rejoinder-y way of his that feels so inviting — have become exceedingly rare, and we should try and treasure them when we can. Whether or not we're in a big marble room.